Merrick RV Sales & Service, Inc. has been a local distributor of Coast-to-Coast Carports since 2004. They are a great deal and the prices include delivery and set up on level ground. Come in and talk to Joni about all of the options and prices. The options are endless. You can have it partially enclosed, fully enclosed, A-frame, vertical or horizontal metal. You can make it taller, add a garage door, add a regular door, or add some windows. There are also many different colors to choose for the roof, sides, and trim. If you want a sturdy, well-built, metal carport or shed that is a great deal, Coast-to-Coast Carports are the way to go. This web-truss style normally comes in widths starting at 50' This is just a smaller one for display. This is our building before wings were added to it. Here is the building after the addition. A catalog picture of an A-frame carport. 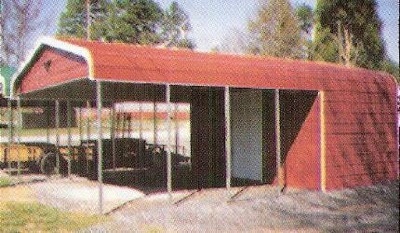 Catalog picture of a utility carport. I have had customers order 12' tall utility carports with both a garage door and walk in door.